I don’t know why I didn’t do it earlier, but what happens when all of my favourite ingredients, i.e. pistachio, avocado, and coconut, are put in one single cake? A DREAM COME TRUE. I just finished 75% of my ielts test this morning, so I feel like I have to write about food to celebrate life a bit. And although it is slowly reaching Autumn here in Hong Kong, whenever I step outside, I literally melt into pieces. Even still, I can’t always resort to bubble tea to cool myself down right? Well, can I?!? I think people who love pistachios would understand how hard it can be to enjoy these tiny yet unbelievably expensive nuts; every one of them counts. I always wanted to save money by getting those with shells, and one time while I was shelling them at home for over an hour and was caught by my brother, and he laughed at my lonely solitude time. Whoops. 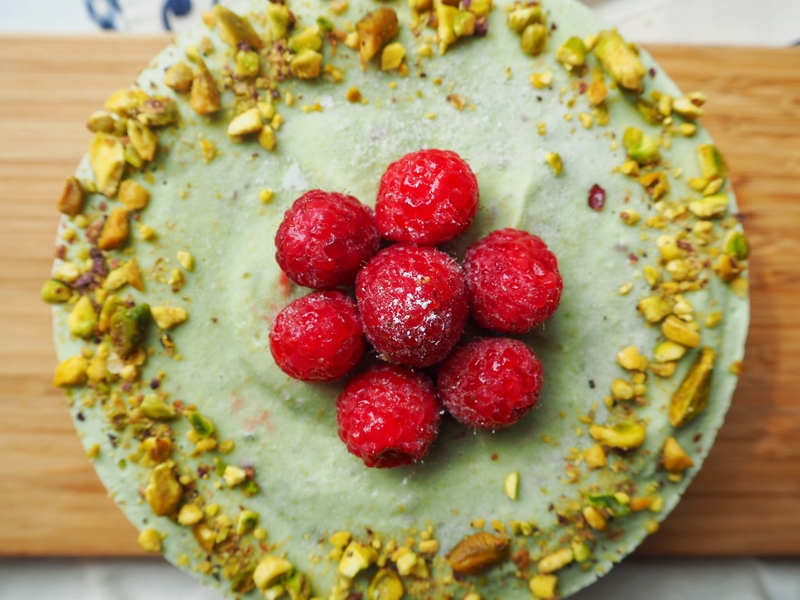 This cake is inspired by the PISTACHIO & ORANGE BLOSSOM RAW AVOCADO CAKE by Unconventional Baker – someone who creates tons of beautiful, raw and healthy desserts. Being as greedy as always, I threw in a dash of coconut goodness, i.e. dessicated coconut and coconut milk, into the cake base and cake filling respectively. In both the original and my own take, every mouthful It is all about freshness brought by the cake’s natural, raw components. With that said, how can I honestly make it sound even better? How about by telling you that this cake is a frozen ice-cream cake? This way, every mouthful feels both icy and creamy in texture, and entirely nourishing and satisfying in feel. In other words, this is the perfect treat for a sunny, warm day when you just want to hide inside a fridge that’s probably too small for you. Using a blender or food processor, ground the crust ingredients into a semi-fine texture with some crunch left. Using a clean blender or food processor, blend all the filling ingredients in high speed until smooth and creamy. Freeze the cake for at least 3 hours to let it set. *To enjoy the ideal texture, please first leave the cake to soften a bit in room temperature for about 10 mins. Creamy and icy texture. Very delicious and refreshing!